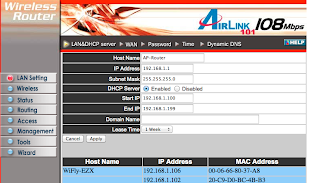 The basic setup procedure that I used is detailed in a previous post covering how to set up an ad-hoc network to configure the WiFly along with some example code make a Teensy3.0 and WiFly operate as an echo server. Assuming this is done, the following code will serve up a simple HTML page that alternately displays "Welcome!" or "Booyah!" when the page is reloaded. This is obviously some pretty brittle and stripped down code, there is no bounds checking on input, nor are the input requests parsed to see what they actually are. Parsing the cmd string in the handle_connection function would handle this, however it does demonstrate serving pages from the Teensy. Output is as expected when the IP for the RN-XV is entered into Firefox, alternating "Welcome!" and "Booyah!" as the page is reloaded. With some simple input parsing, this would make it easy to do basic querying of the state of the Teensy. A recent order from Sparkfun arrived, including a 3.3V Serial LCD and a Roving Networks RN-XV WiFly module. The RN-XV module is intended to be a drop-in replacement for an XBee, except that it operates over WiFi. 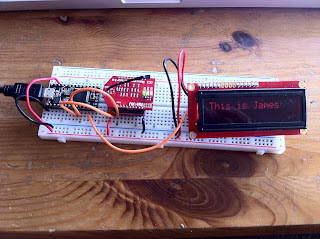 At about $35, it is just about the cheapest way to make your project wireless enabled. The module is 3.3V, meaning some form of level shifting is needed with a 5V system like an Arduino. You can use this module with an Arduino via an XBee shield pretty easily. However it is even easier to use with the 3.3V Teensy 3.0 ARM board, provided you have a breakout for small-pitch XBee module footprint. 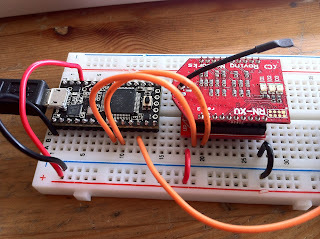 The Teensy is also nice for this application because it has multiple serial ports, so you don't need to use the SoftwareSerial library, or program the board, then disconnect to use the wireless. Setting everything up was pretty easy once I knew what to do, but this post summarizes the process should I ever need to do it again. Only four connections are needed once you're set up, 3.3V, GND and two data connections. DOUT from the Teensy3.0 Serial3 connects to DIN of the RN-XV and DIN from the Teensy to DOUT to the RN-XV. 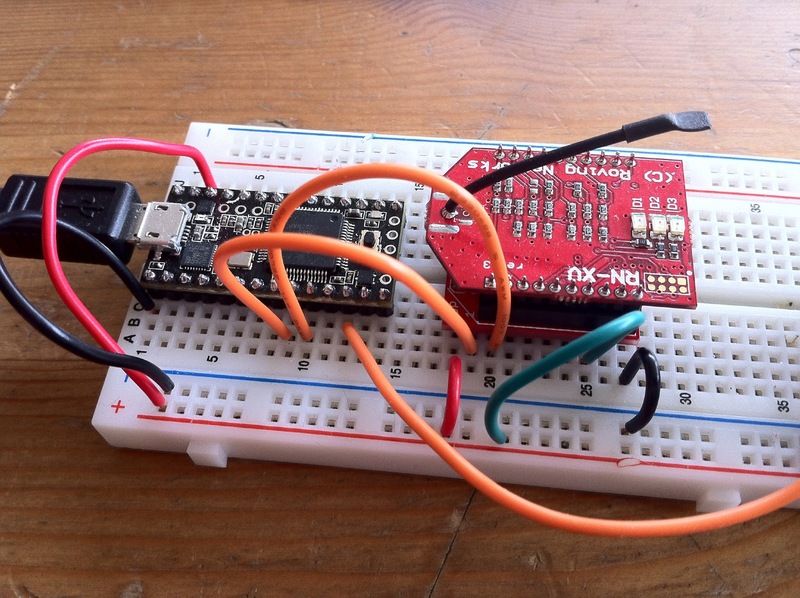 This makes the module operate as just a serial port, making it pretty easy to interface with. The remaining orange wire connects the Serial LCD display, more on this later. To get started, I found it was easiest to set the RN-XV in ad-hoc mode. 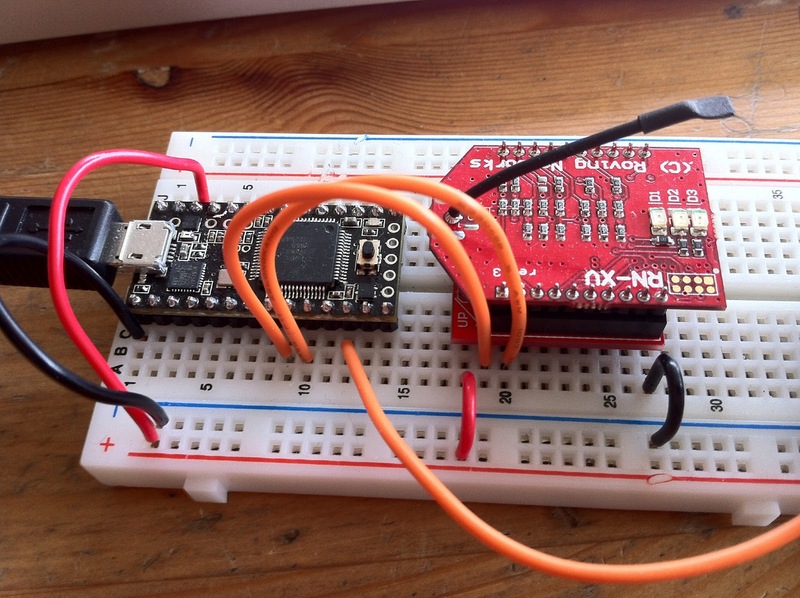 This can be done by connecting pin 8 to 3.3V and will cause the module to create its own wireless network. When this happens you will see the status LEDs blinking green, orange and red; they're doing it, but you can't really see in this picture. Note the additional green wire to 3.3V connected to the 8th pin. The WiFly shows up towards the bottom as WiFly-GSX-a8 or something similar. 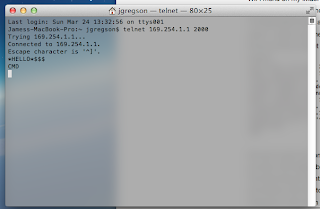 If you connect to this network, you can then telnet to the module using the IP address: 169.254.1.1, port 2000. The module should then respond with a *HELLO* string, at which point you type $$$ to enter command mode. 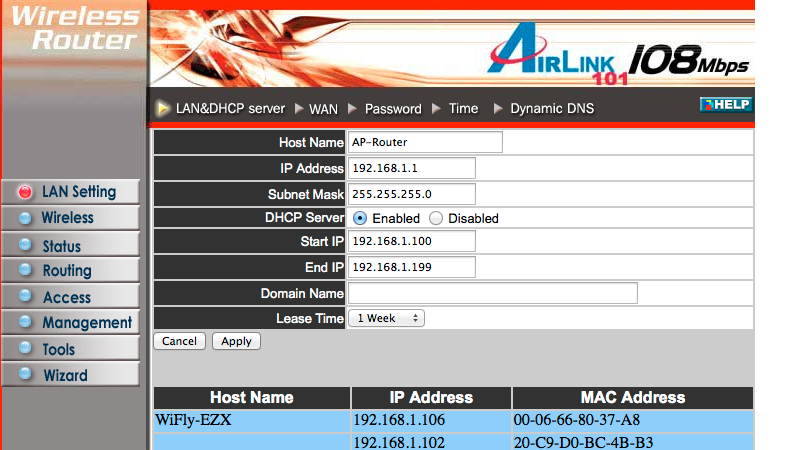 Command mode allows you to set up the module for your network. I found that sometimes the module would respond with a confirmation and sometimes would not. I repeated the process a few times in the hopes that some combination would stick. After this process, remove the power and and connection from pin 8 to 3.3V. This will cause the device to try to connect to your wireless network. Conveniently the WiFly module had an entry: 192.168.1.106. Depending on your router, you should be able to set up a specific IP address for the router to assign to the module based on the MAC address. 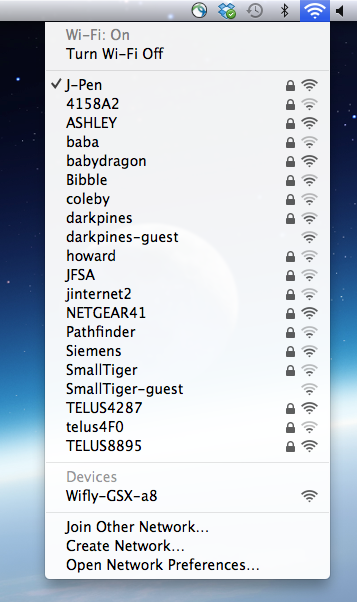 However my POS router does not allow this. 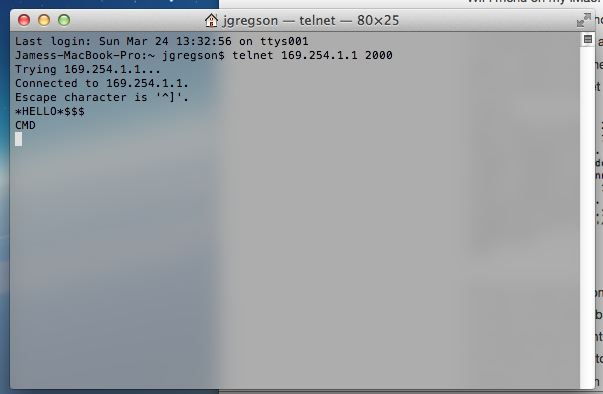 I could then telnet to the module's IP address, again using port 2000. This module responds with the same *HELLO* prompt, indicating that everything was successful and the module is on the network and communicating. Hooray! An utterly useless internet thingy! I've started using CMake for pretty much all my development work and have been quite happy except for a few minor issues. One of those is that the build-products are put in Debug and Release directories by default, instead of single output directory. You can add an install target to do this, but XCode won't apply it through the UI. Ditto goes for a post-build copy step. It took a while to find, but it's actually simple to get binaries placed into a directory of your choosing. In the example project, code and the CMakeLists.txt file is in the code/ subdirectory, I build using CMake/XCode in the build/ subdirectory and I want the build products placed in the bin/ subdirectory, regardless of whether they are built as debug or release. The set_target_properties() command allows you to set the runtime output directory. You'll see this a fix similar to this online in many places, but it will put the built executables in bin/Debug or bin/Release, instead of just bin/. What was not immediately obvious is that it can be set per-build-configuration, causing all build products to be put in bin/. When solving large-scale PDEs, it's generally preferable (where possible) to have a symmetric discretization so that the conjugate gradient method can be used. Conjugate gradient uses relatively little memory compared to more general purpose methods (like GMRES) and can also take advantage of symmetric preconditioners (like incomplete LDL^T) that are faster and use lower memory than preconditioners such as incomplete LU. However applying boundary conditions to the problem can be an issue, since it is easy to end up with a non-symmetric matrix unless the constrained variables are eliminated from the system matrix. This means that solvers like GMRES have to be used, which is costly in terms of computation and memory. 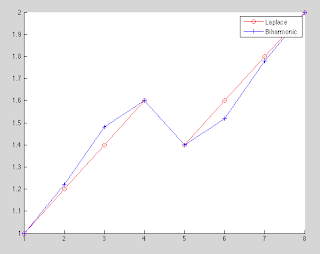 The following Matlab script gives an example for how to apply linear boundary conditions via an auxiliary boundary condition matrix suggested by a labmate of mine. It shows both pin (Dirichlet) constraints and gradient (Neumann) boundary conditions at the domain boundary and in the interior. The only downside is that Neumann constraints are a bit peculiar to specify since one of the variables must be eliminated from the boundary condition matrix. However this can usually be specified fairly easily, and certainly more easily than eliminating the variable from the system matrix. % energy is applied to the constrained grid points. % which is square and symmetric. % the boundary condition matrix. 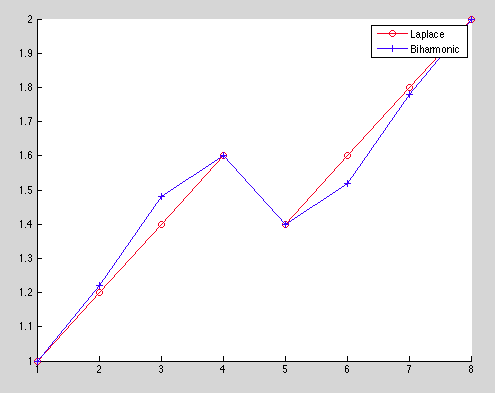 Both solves reproduce the boundary conditions correctly, but the biharmonic solve finds a solution that is smoother than the Laplace solution around the interior constraints. A recent project has me playing around with some fluid simulation. I got some nice looking results and thought I would post a few. You can see how the tape is pulled up at the near edge; this is about 2mm of shrinkage which is not too bad. 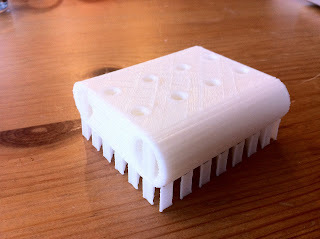 But this is also a relatively small part, perhaps 5x5x4 cm, and the problem gets worse as the parts get bigger. 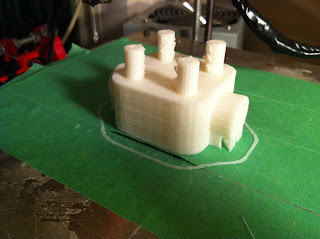 A partial fix is to use a heated bed, but the Gen6 electronics for my printer do not support controlling a bed. 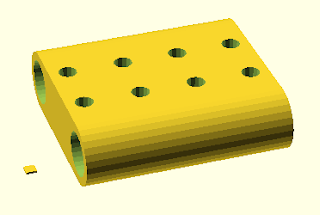 The little block is some dummy geometry added to lower the bottom of the geometry about 1.5 cm. When printed with support, the extra flex of the support lets the object stay attached to the bed without the terrible shrinking. Part of this seems to be the extra flex, but I suspect that another part is less direct contact with the large metal build-plate, which acts like a heat sink, so the whole part cools more uniformly. 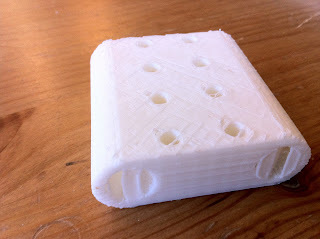 After pulling it off the build plate, you can see that the support material on both sides is in contact with the table, indicating little to no warping. And this is a big part, roughly 10x8x3 cm. The downside is that you now have to deal with the support material. If this is the same as the print material, it can be difficult to clean off without leaving a nasty surface finish or changing the part accuracy. 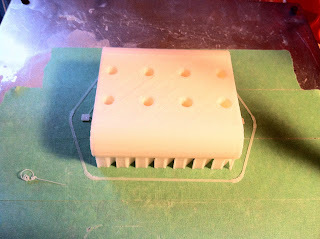 For example, filing the support out of the horizontal holes without accidentally changing the hole diameter. But once done carefully, the part is remarkably accurate: the height as measured at all four corners only differs by about 0.15 mm (with a layer height of 0.3 mm), and the holes are actually round and not elliptical.